The Kontour Stylus (TM) kicks writing up a notch with a new way of writing and typing. With its retractable, click ballpoint pen featuring Dokumental Ink hidden inside the capacitive stylus, this pen is sure to stay close by your side. Whether you have long fingernails, wear gloves, or just want a smudge free screen, a Kontour Stylus (TM) makes writing on your touch screen a breeze! Retractable ballpoint pen hidden inside the stylus. Value priced incredible writing pen. Featuring a 1.0mm Medium ballpoint click black ink cartridge, this pen will be one of your client's favorites! Your campaign message will always be in great "shape" when it includes the Quarter pen! This stylish ballpoint pen features a contoured shape for comfort, barrel with colored trim, medium 1.0 millimeter point and blue ink. This fantastic giveaway is great for any project, business, conference or event. 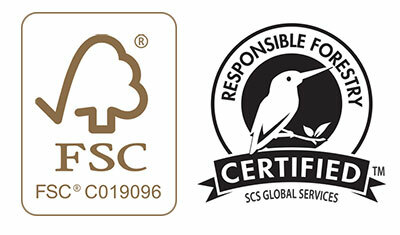 Have your company's logo printed on the barrel so you and success will be in close "quarters." Order yours now! Quarter Pen. Year Round Promotion. EQP or Pricing Discounts Do Not Apply. The Lusitano is an inexpensive pen that writes super well. YES! You read that correctly. The Lusitano has a transparent barrel with black ink. This pen will change the way you look at a value priced pen. Medium 1.0mm retractable ballpoint, black ink. Year Round Promotion. EQP or Pricing Discounts Do Not Apply. Looking for a promotional product that's got your name written all over it? 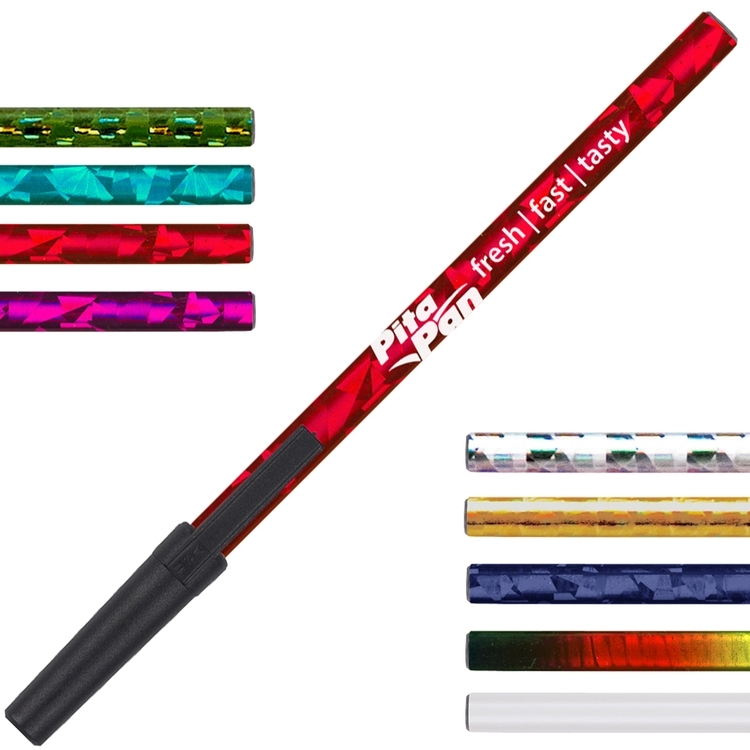 These Transfer Wraps (TM) stick pens are a great way to expand your message whether you choose full or partial barrel coverage thanks to the customizable opportunity of 4-color process. 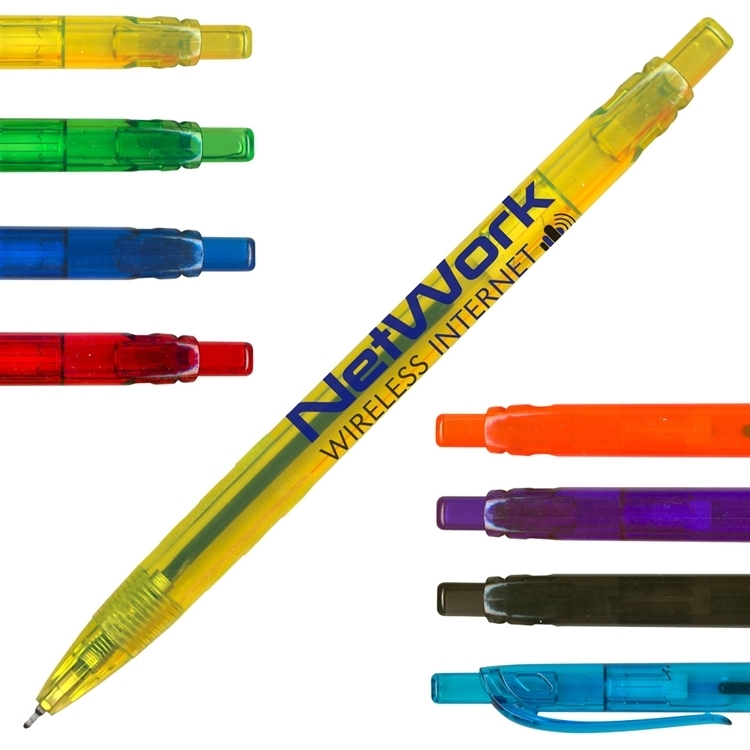 These pens are ideal for virtually any business. 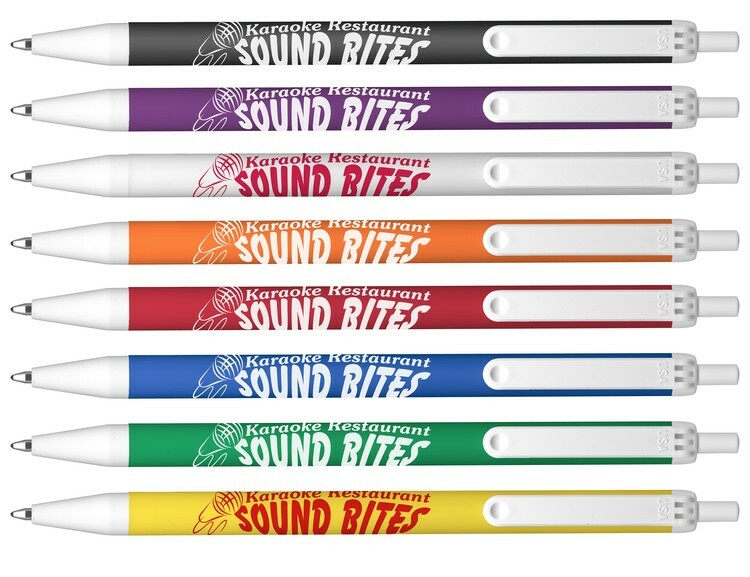 These unique writing instruments are also perfect for school fundraisers and industry tradeshows. Keep your business heading in the "write" direction! 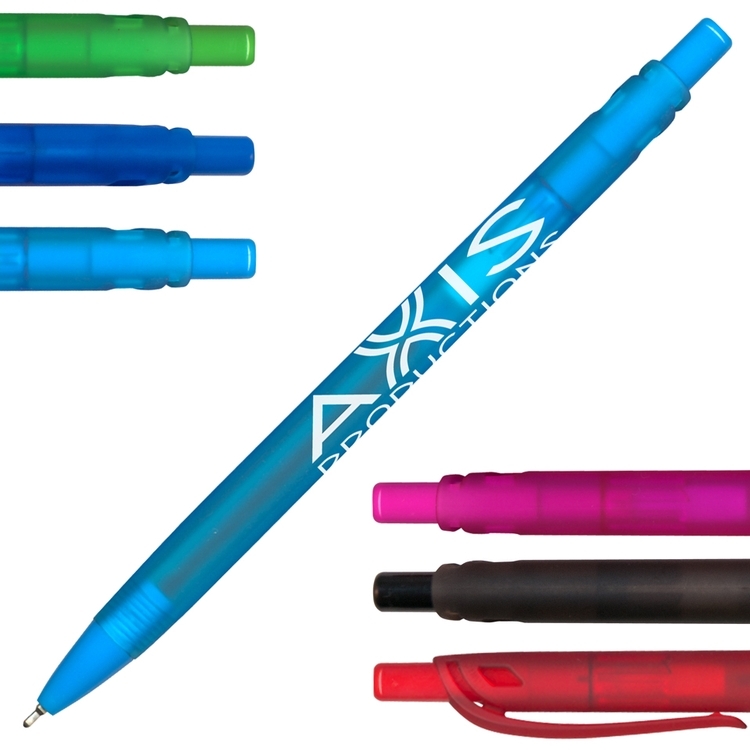 Stick pen with custom 4-color process transfer wrap. Paso Fino pen with industry first 1.20mm retractable ballpoint. Smoother writing pen still with a low, low price. Year Round Promotion. EQP or Pricing Discounts Do Not Apply. Rid the territory of poor performing pens! The Outlander (TM) retractable ballpoint pen features a medium 1.0 point, translucent barrel, grip section and smoothly writes in black ink. The slimmer styling provides a comfort fit so that it will soon become your constant companion. This handy writing implement would also work well as a giveaway at tradeshows, conferences and conventions. Perfect for banks, insurance companies and schools too! Retractable ballpoint pen with slim, translucent barrel and smooth writing ink. With smooth writing PREMIUM Dokumental ink, the Classic Stylus Pen will be an instant classic with your clients. Available in 4 different trendy, millennial loving barrel colors and accented with chrome trim. 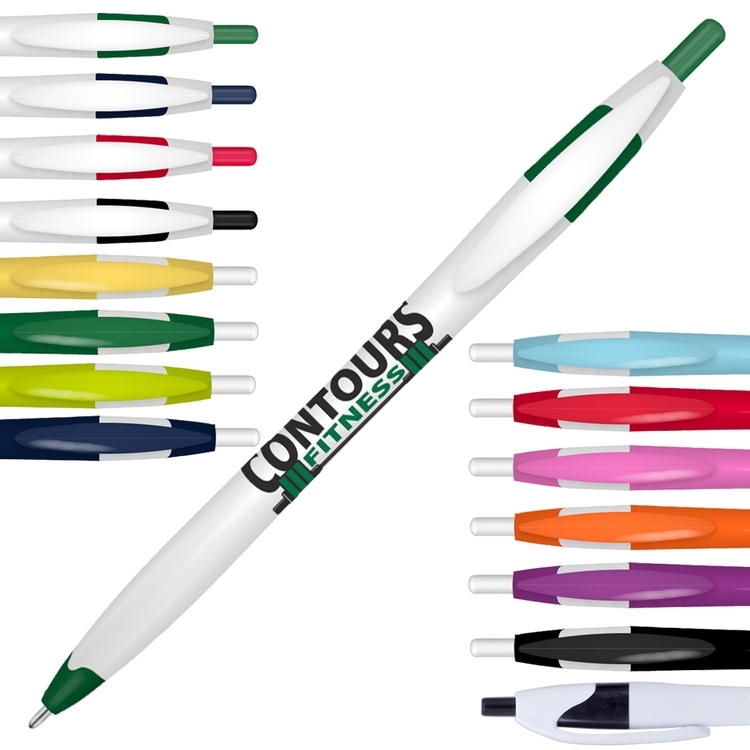 The large imprint of this pen will show off even the most difficult of logos to print. Medium 1.0mm Retractable Ballpoint Pen with blue writing ink. Draft Stylus / Pen With Dokumental Ink Year Round Promotion. EQP or Pricing Discounts Do Not Apply. Clydesdale smooth writing pen. Year Round Promotion. EQP or Pricing Discounts Do Not Apply. It's time for a Fiesta (TM)...or two! 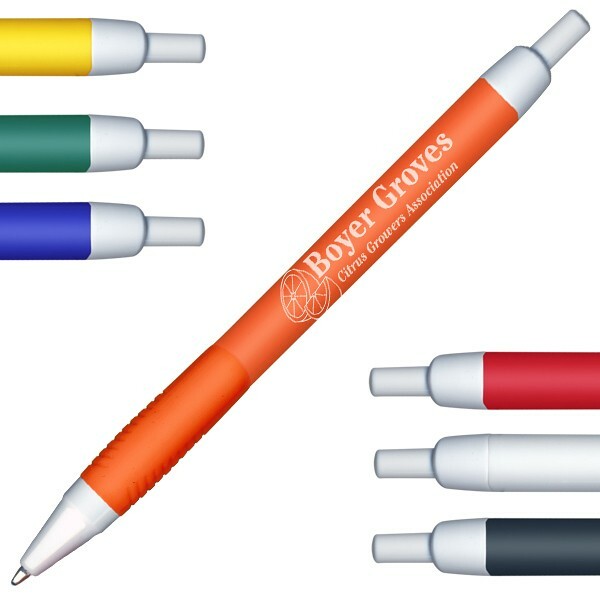 This colorful writing implement features a plunger design, medium 1.0mm point, blue ink, white barrel and brightly colored trim, making it an excellent promotional product for virtually any business. 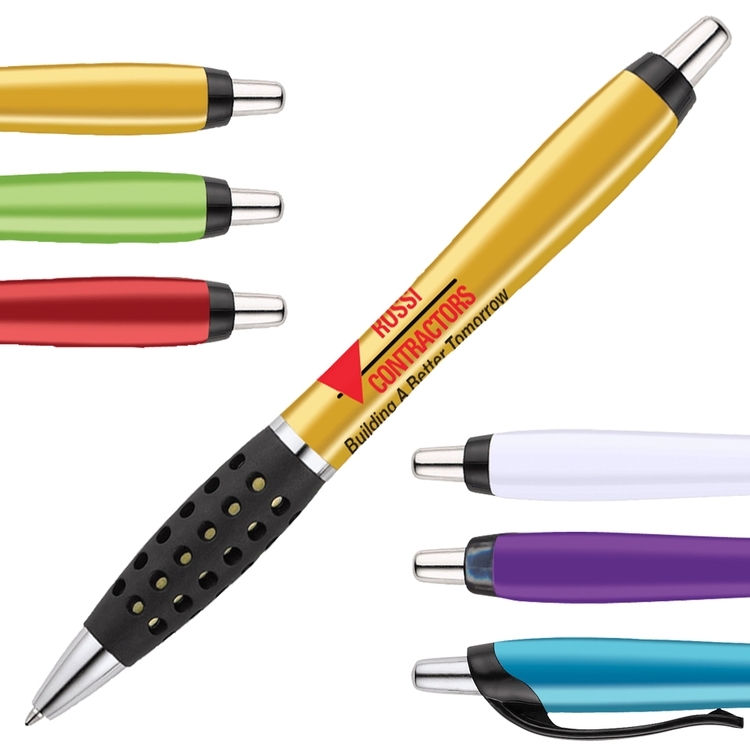 With a comfortable grip and clip that matches the barrel, this retractable ballpoint pen would also work well as a giveaway at tradeshows, conferences and conventions. Perfect for insurance companies! 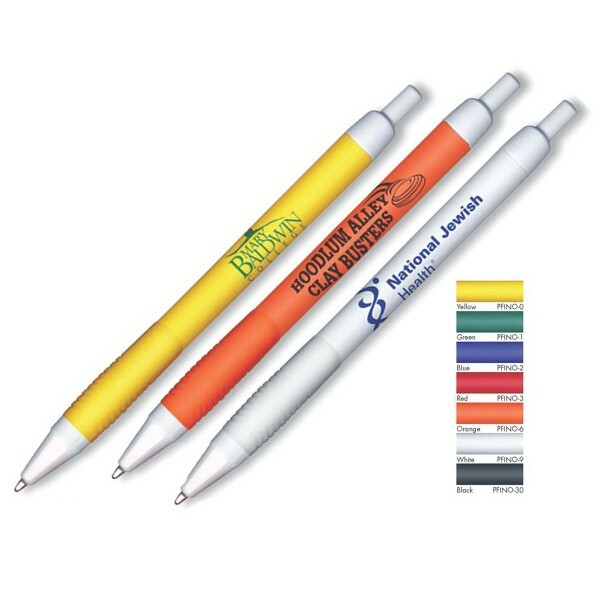 Retractable ballpoint pen with grip features bright colored barrel with black trim. Glo (TM) Ballpoint Pen That Lights Up! 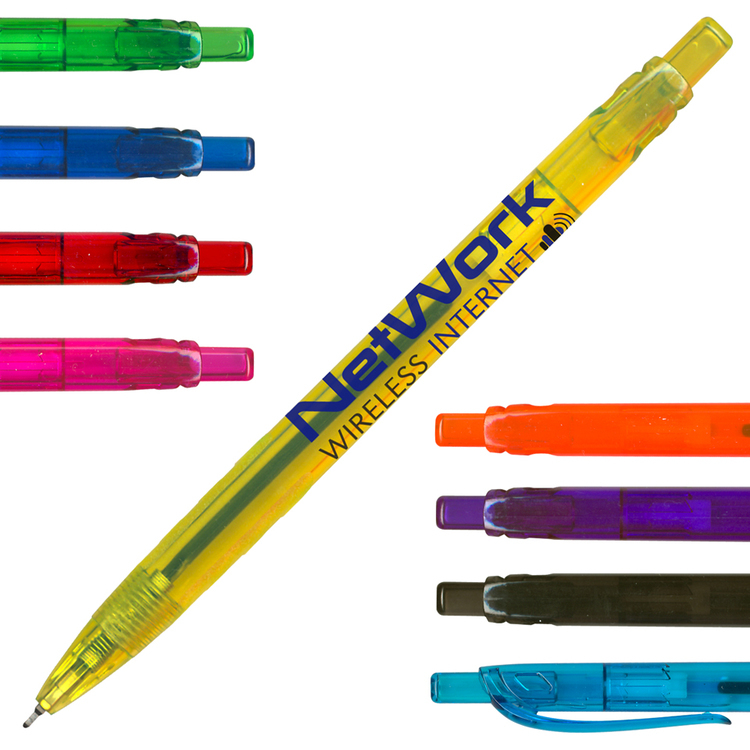 Shine a light on your creative side with our Glo (TM) pens! 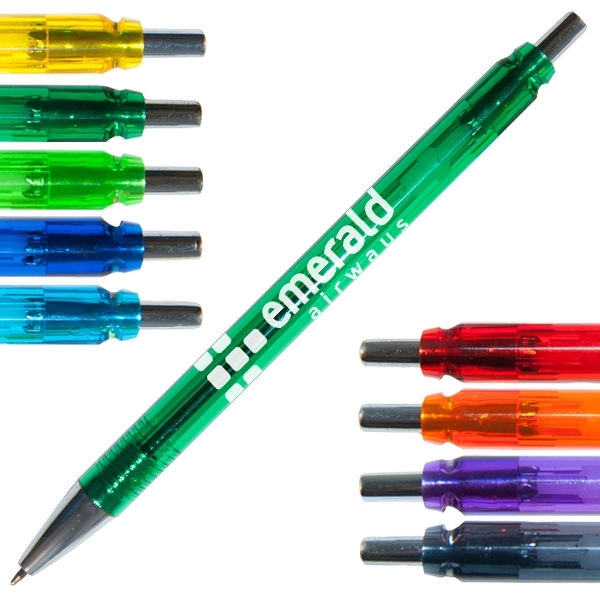 Featuring a medium 1.0mm point and blue ink these inventive writing implements also light up in red, blue or green. Choose the color that suits your project best; add your company name or logo and hand the finished projects out at ball games, grand openings, healthcare events and industry tradeshows. WARNING: This product is not suitable for children under 12 years of age. Ballpoint pen with light, medium 1.0mm point, blue ink. 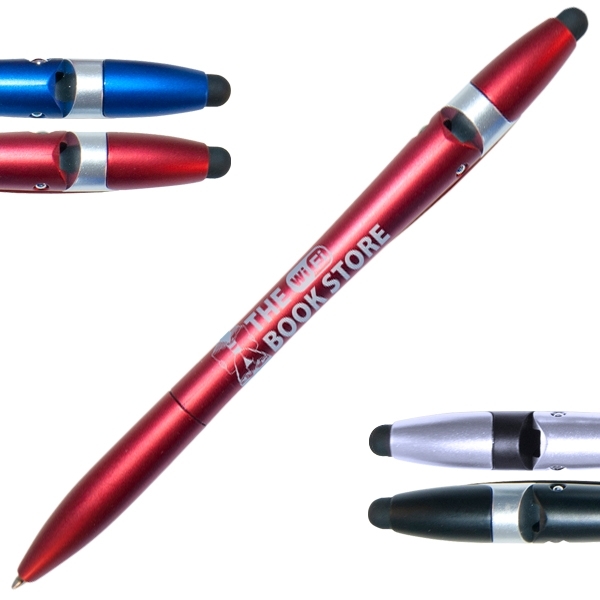 Effectively promote your business with this USA Click(TM) ballpoint pen. Coming in a medium, 1.0 mm point style, this black ink pen is a classic hand-out that your customers will keep at their desks at home or in the office. 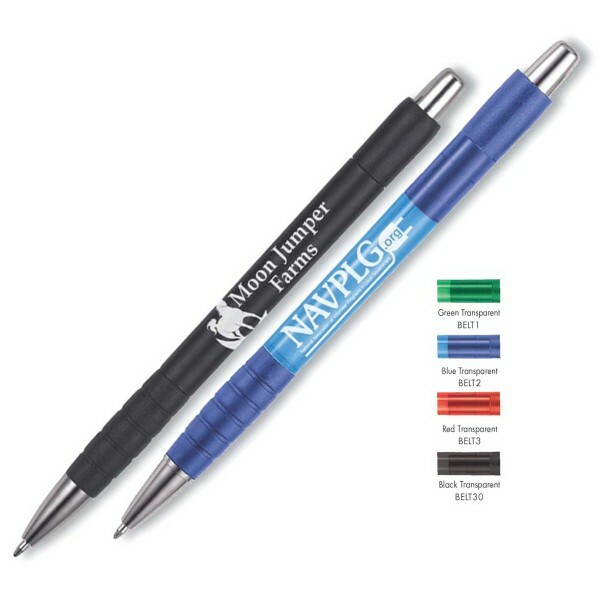 Choose from a variety of colors to coincide with your brand image and customize with your company name and logo for added appeal. For an eye-catching look, take advantage of a multi-color imprint! A memorable giveaway that your customers will use on a daily basis, this Voltear2(TM) ballpoint pen features a 1.0 mm retractable ballpoint that comes with black documental ink. Easily extend the ballpoint when the tip is pointed downward and locks in position for writing. When finished, just turn the pen back upward and the ballpoint retracts using gravity.  Customize this promotional necessity with your logo for your next event. With smooth writing PREMIUM Dokumental ink, the ARGENT pen will be an instant classic with your clients. Available in 9 different translucent barrel colors and accented with matching trim. 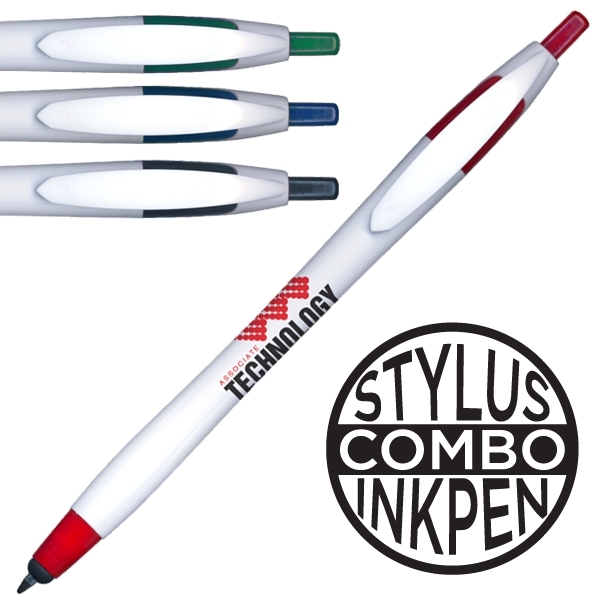 The large imprint of this pen will show off even the most difficult of logos to print. Medium 1.0mm Retractable Ballpoint Pen with black writing ink. Transform the way you view stylus/pen combos! The affordable Transformer (TM) is a click pen and stylus in one. 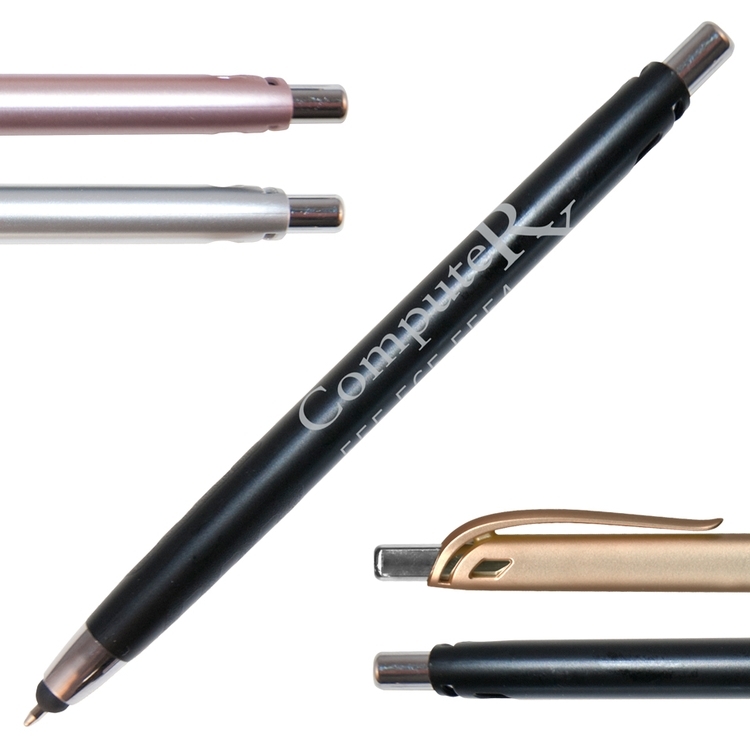 The innovative design hides the pen inside the stylus until you "click" it free. The stylus is compatible with all capacitive touch screen devices such as GPS, tablets, and smartphones. With a comfortable grip, great writing ink, and long lasting stylus, the Transformer (TM) may be the last pen/stylus you will need. Click pen and stylus in one, pen hides inside the stylus until you "click" it free. 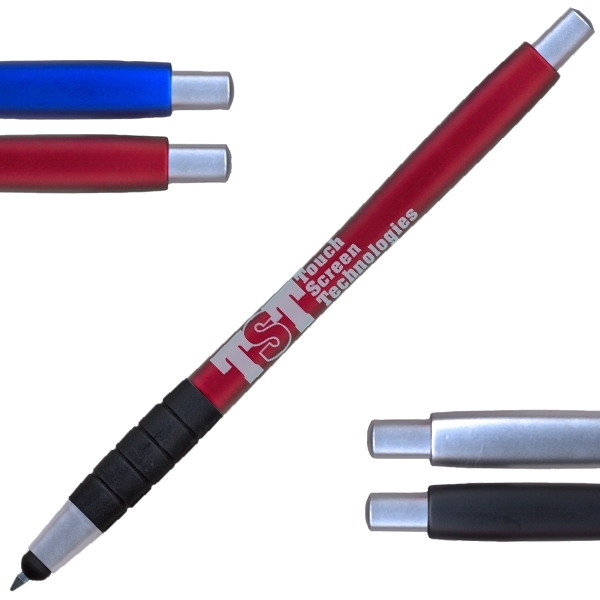 Remind them of your brand every time they're ready for a signature with the distinguished look of this Belgian Pen. 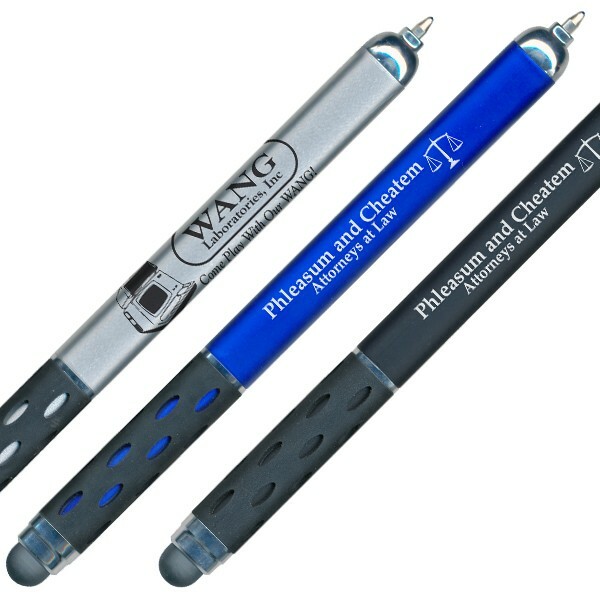 Choose between a 1.0 mm black ink pen or a transparent 1.0 mm blue ink version. 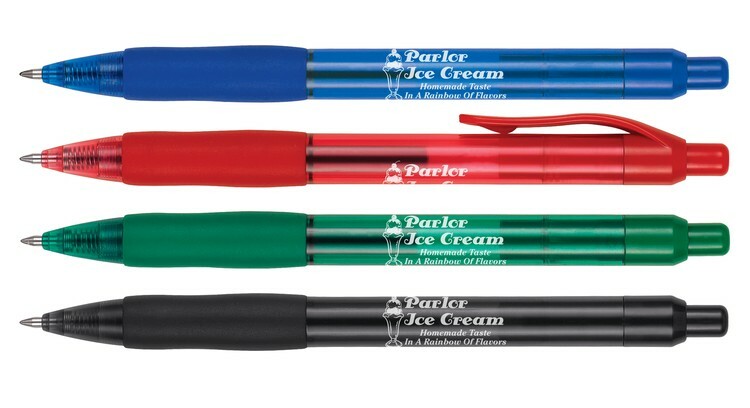 Each matte pen features rich colors with chrome accents. 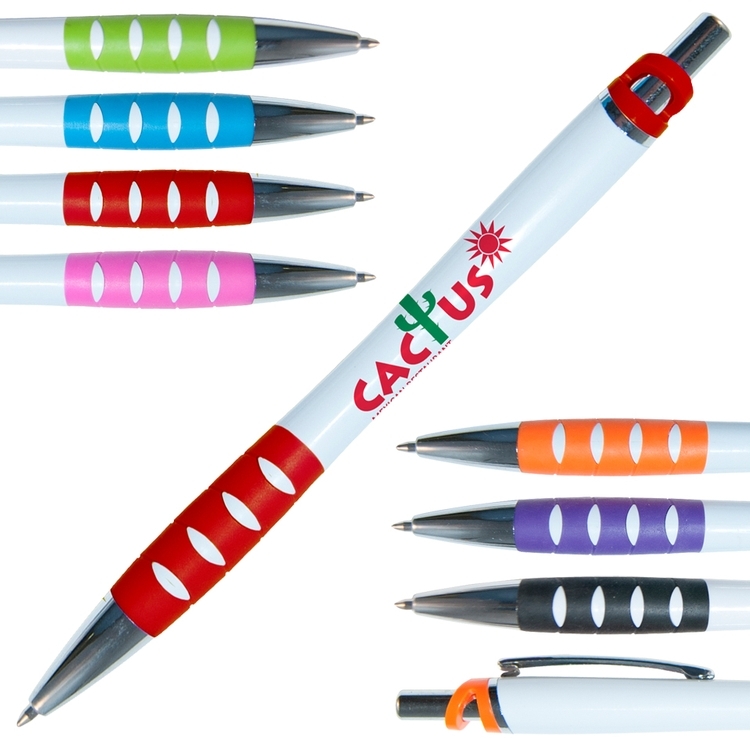 A bright translucent barrel and matching grip ensure that this pen will get noticed. 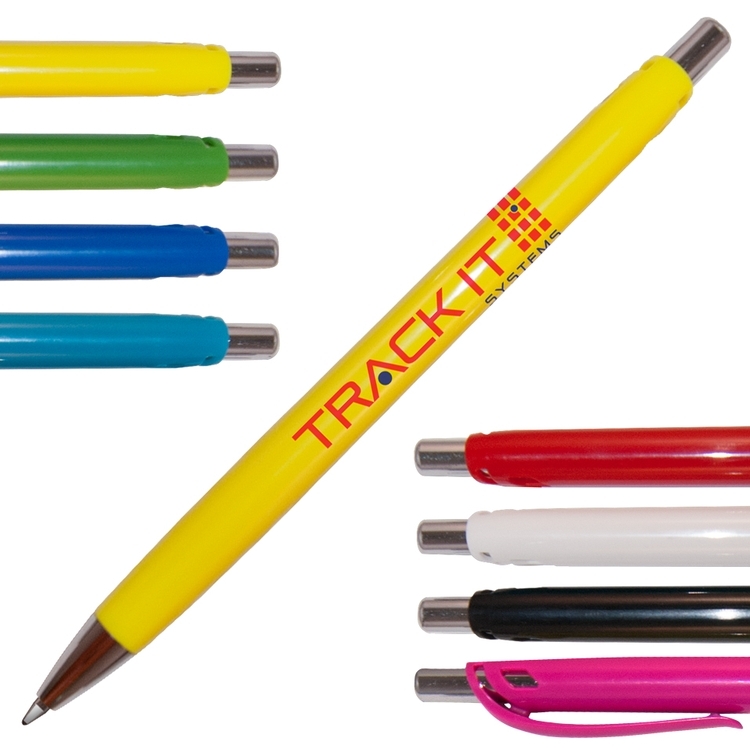 Please specify item number, pen color and imprint color when ordering for a true match for your organization.